Today I broke down and made a word cloud. But, it’s a pretty awesome word cloud. It shows the top 75 words used in my research publications in 2013 (excluding common words). 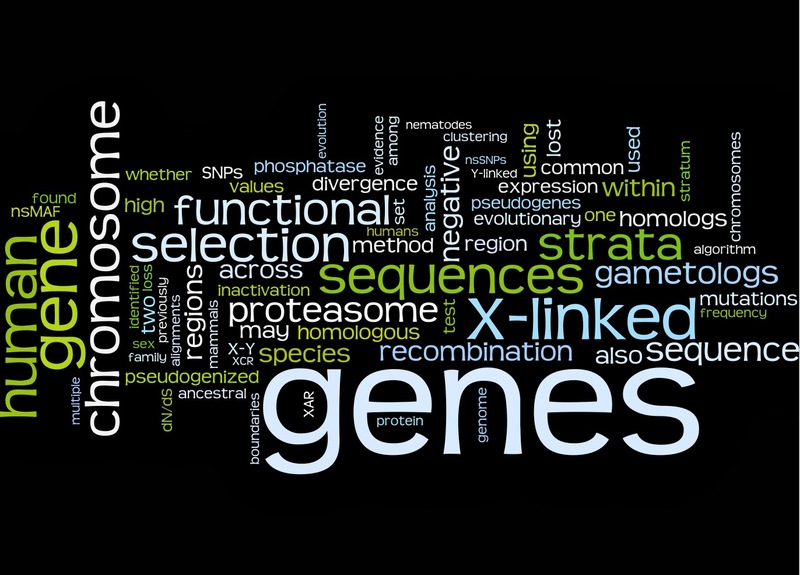 M. Wilson Sayres’ 2013 research publication word cloud. I used http://www.wordle.net, which is nice because it also has code you can modify yourself. I was also directed to http://www.tagxedo.com, which has the advantage of making word clouds in fun shapes. What I find interesting about this word cloud is that I was surprised by what I saw, and what I didn’t see. I was surprised to see “genes” be the top word, because my recent projects, and much of my focus in graduate school, was on intergenic regions. Turns out, though, that 2013 was my year for genes. I was also surprised at first that I didn’t see “Y” or “X”, but then realized that I asked the program to ignore common words, which probably includes all single letters also. I was happy to note that “X-Y” is in there, and so are “X-linked”, “Y-linked”, and “XAR”. If I can remember, this seems like a fun annual tradition to reminisce about the projects published in the previous year. Given that it can sometimes be months or over a year from the completion of a project until its publication, this is definitely a different snapshot, than if I were to use text from the projects I’m currently working. Wordle allows you to save your images in a public gallery, so feel free to share your 2013 word cloud in the comments! I’m also happy to update this with other word cloud generation software or codes that you share in the comments.